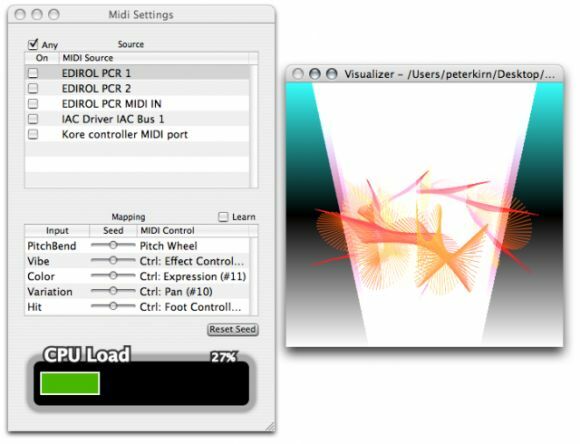 Free tools like Quartz Composer (Mac) and Processing (cross-platform) now make it possible to run visuals and music on the same computer. Accelerated on the 3D graphics card in your machine (or integrated graphics on the new MacBooks), you can run live visuals without taxing your CPU, and use MIDI and/or audio signal to translate sound and music into interactive animation. Translation: you jam, eye candy runs in the background. On the Mac, you can even easily assemble whole sets of songs using Rax with Quartz Composer visualizations, as seen here previously. I’ll be teaching a workshop on some of these basic techniques and interactive animation and video/image processing in general. The workshop will be here in Brooklyn later this month, and I’d like to invite Create Digital Music readers in the area. We’ll focus on Quartz Composer because it’s quite easy to learn, but the techniques will be applicable to other software on both Mac and Windows. The fact that QC integrates so nicely with Rax should make this especially interesting to musicians wanting to add live visuals. Enter code PK0806 to receive a 10% discount on a 3-month trial membership or 1 free workshop at 3rd Ward. 3rd Ward is a 20,000 sq. ft. workspace and studio facility for artists & creative professionals, located in East Williamsburg. If we don’t get enough people registered, we’ll have to cancel, so please forward to anyone interested. Thanks!